MISSION Nassau Humane Society is dedicated to the humane treatment of all animals; to alleviate their suffering and neglect, to support the human-animal bond, and to foster an environment in which people respect all living creatures. We will pursue workable solutions to the most urgent animal welfare needs of our community, which are animal overpopulation and homeless pets. Our solutions will emphasize the mutual benefit of bringing pets and people together. We will provide rescue and control as a lifeline to animals in need and for the necessary protection of our community. We will encourage and provide for pet adoption, animal-assisted therapy, pet care education, outreach spay and neuter program and other welfare efforts, all in support of our comprehensive community service obligation. 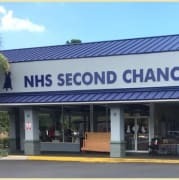 NHS Second Chance is a resale store of gently used and collector items. 100% of the proceeds earned in our store are turned over to the Nassau Humane Society to support homeless animals and FURther our mission. Would you recommend NHS Second Chance? It's such a fun place to volunteer. Great volunteers already working there are fun to be with. We are making money for the homeless dogs and cats in our community - that's way cool. Second Chance is one of the friendliest, neatest "not your usual re-sale shop" on Amelia Island, FL. It's great to be in fab store & surrounded by people who care!